You cannot be born into the Kowalsky family and not like hockey. Even if you never played the game, you come to love it, because hockey is as essential as breathing in this family. In my family, where did the enthusiasm for hockey begin, like the game itself it is steeped in history and a little murky. My great-grandfather Adam Kowalsky arrived from Poland in 1905, and hockey had already been well established in Canada. The early 1800’s saw the first primitive version of ice hockey in Canada and the game believed to have spread throughout Canada via Scottish and Irish Immigrants and the British army. Many presume ice hockey is derived from field hockey that was being playing in Britain at the time. However, the name hockey has been attributed to the French word hoquet (shepherd’s stick); and the game itself has a long and rich heritage in Canada. My fourth great grandfather James Stapleton arrived in Canada around the early 1800's from Ireland, (his granddaughter would marry Adam Kowalsky). Is it possible that he was among one of these early immigrants to bring this sport to Canada? Is it possible that the Kowalsky hockey gene all began with a young boy from Ireland? Even before Kowalsky’s were being born in Canada the rules for the game of hockey had already been established by students at McGill University in Montreal Canada and by 1879 several amateur clubs and leagues were established in Canada by the late 1880’s. 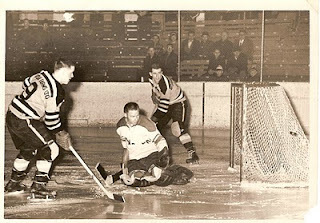 By the time my grandfather and his siblings were born the game of hockey was well entrenched in the culture of Canada. My grandfather Jerome, first born Canadian Kowalsky loved hockey and every one of his six sons would go on to play the game. 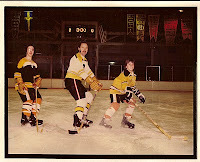 My father would begin playing hockey as a very young boy finally retiring from the game a couple of years ago at the age of 70. My brothers along with many of my cousins lived and breathed the game, actually most still do. For myself, I learned to skate at a very early age, yes not long after you learn to walk in this family the skates come out. 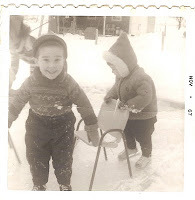 My first introduction to ice was in my backyard. For many years, my Dad, as his last fatherly duty before retiring for the day was to head outside around midnight, and pull out the hose and water down the backyard to create our own ice rink. It was on this rink that I learned to skate. Saturday nights were reserved for hockey. As routine as going to school, having dinner and putting on your socks in the morning, we sat down every Saturday night around the television and watched Hockey Night in Canada. There was no deviating from this plan no matter how important you thought your priorities might be. Although some of my uncles and cousins have longed for a career in hockey it has been my cousin Rick Kowalsky, who has managed to take his hockey skills to a national level. He currently is the head coach for the Trenton Titans in ECHL where he has become one of the up and coming coaches in the league, winning coach of the year in 2008/09, Rick was once drafted by the Buffalo Sabres back in 1992. My Dad and my uncle Bob will also claim a small piece of history for coaching two young hockey players named Rob Blake and Dwayne Roloson, who undoubtedly go on to hockey fame. 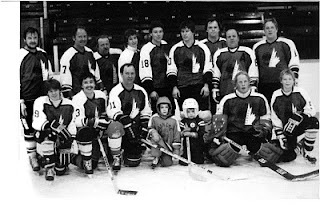 In 1979, two generations of Kowalsky men, came together, and formed the Kowalsky Hockey Team and played a game of historic proportions. The male members of my family gathered on February 4th, to play a local team. Surrounded by family and friends, the Kowalsky men displayed their skill and love of the game, winning the match, Kowalsky’s 5, the other guys 4. I believe there were a few rematches in the years to come but that was our miracle on ice. As for me, well I was unfortunately not born with the Kowalsky sports gene. I took figure skating for many years but Dorothy Hamill I was not. Nevertheless, I love sports yet somehow the co-ordination of playing them has escaped me. However, I have been an avid supporter of my Dad, brothers, uncles and cousins. Over the years, I have paid my dues, huddled under a blanket, in the stands of ice rinks across Ontario, where I have watched my family play this game they love so much.